Navaratri is the auspicious festival celebrated all over India. On Navatri festival , the nine forms of Goddess Paravati are worshipped on nine days and tenth day is celebrated as Vijaya Dashmi. Dashmi is the tenth day of the month ashvin marked the victory day for two reasons. One is Goddess Paravati incarnated as Goddess Durga had won the victory over the powerful demon named as Mahishasur and other reason is Lord Rama had won the victory over demon Raavan by killing him. Navatri and Dusshera is grandly celebrated in foreign countries too. People on this occasion fast on all the nine days by just having some light food which is called as falahar. All the nights are celebrated with big pujas and of course people enjoy by performing dandiya or garba dance. This festival makes us to know the all forms of Goddess Paravati. So today I would like to detail the story about the nine goddess so that we can know some fact behind the incarnation of Goddess Paravati. This is the most important thing were some people are still unknown to it. Along with this religious post, I would also like to post one falhar recipe that is Sabudana vada. Sabudana vada is the famous Maharashtra snack . These vadas can be relish on vrat or fasting days. Without wasting much time let’s start the post with nine forms of Goddess, ending with the recipe which can help you all during your fasting days. 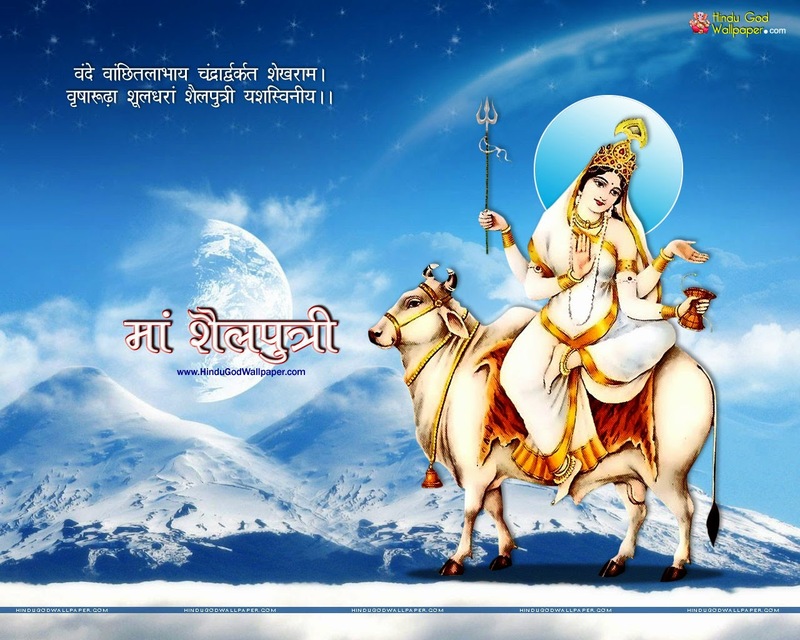 Shailputri Devi is the supreme form of Mother Nature and is worshipped on first day of the Navaratri festival. She is also known to be Goddess Paravti, wife of Lord Shiva and mother of Kartikeya and Ganesha. As she was born to the King of mountain, her name details the same, that is word Shail means mountain and Putri means daughter. The devoting the Goddess Shailputri Devi, blesses her devotees with strength to make full use of precious human life. 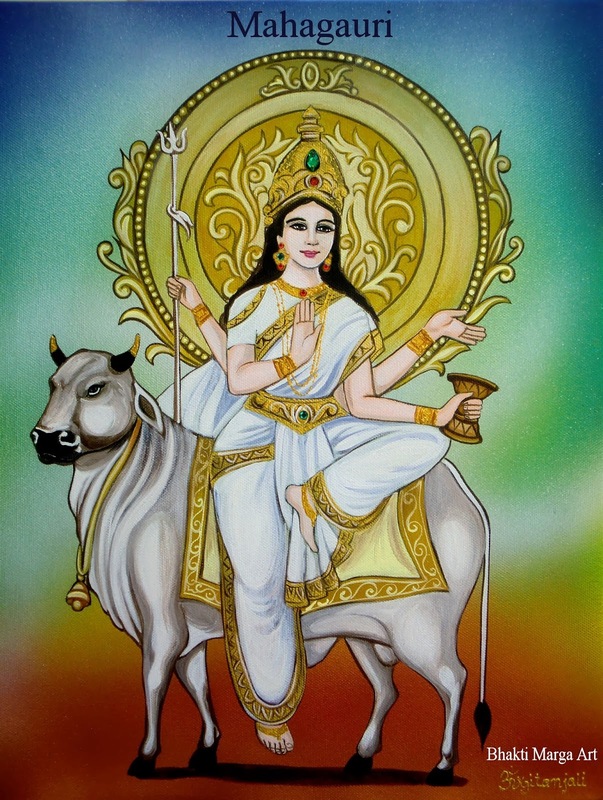 The iconography of goddess Shailputri is the divine lady sitting on bull (nandi) with trishul in her right hand and damru (musical mini drum) in her left hand. 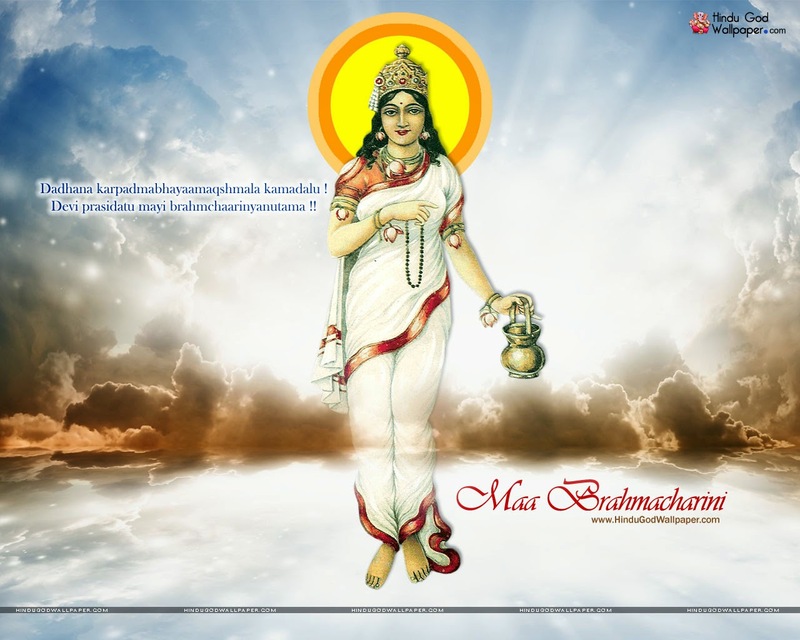 Goddess Brahmacharini is worshipped on second day of the navaratri festival. The name Brahmacharini means “Brahm” as tapa or meditation and charini means one who does tapa. This manifestation of Goddess Paravati is enormously happy and magnificent. Goddess signifies love and knowledge. She blesses you to move forward without getting disheartened with the challenges coming on your path. Also blesses with emotional strength to overcome the difficulty and lends the confident to face the bad time. It is said that Brahmacharini Devi spent hundred of years in meditation without eating in order to obtain Lord Shiva as her divine husband. The iconography of the Goddess Brahmacharini is seen wearing white pure saree with rudraksha in her neck ,as it is originated from Lord Shiva’s tear. On her right hand, she is holding japmala and kamandal on left hand. The third form of Goddess Paravati is Chandraghanta is worshipped on third day. This goddess has the semi circular moon or Chandra in her forehead in the shape of bell or ghanta. So she is named as Chandraghanta. She blesses her devotees for harmony and prosperity in their life. The iconography of Goddess is seen to ride on tiger. She is depicted with ten hands and three eyes. Goddess Chandraghanta carries Trishul, Gada, Sword and Kamandal in her four right hands and keeps the fifth right hand in Varada Mudra. She carries lotus flower, Arrow, Dhanush and Japa Mala in her four left hands and keeps the fifth left hand in Abhaya Mudra. 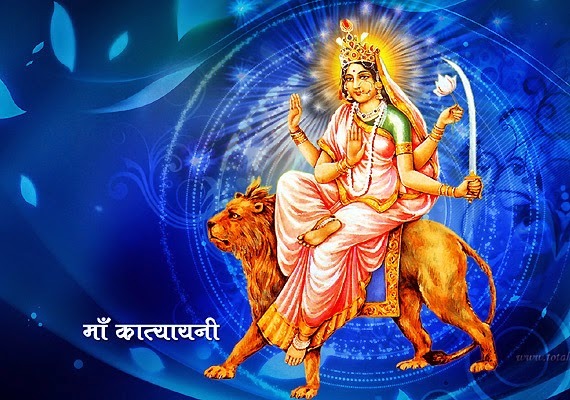 Goddess Kushmanda mata is the known to be the creator of the world. 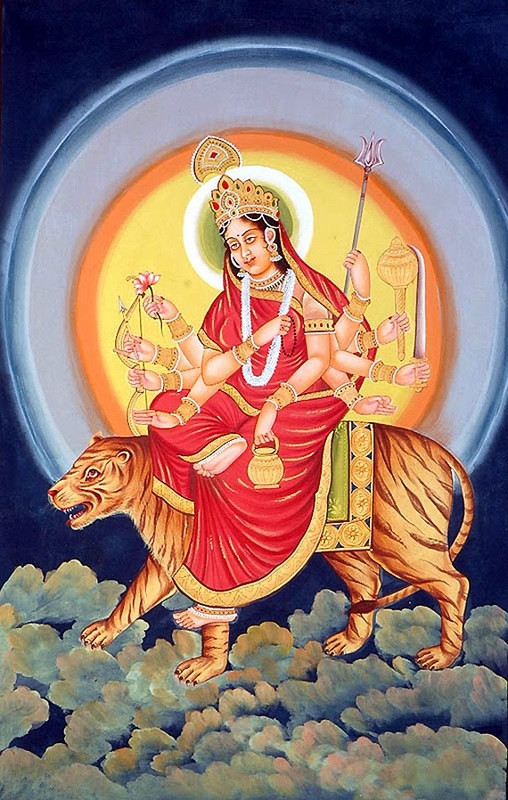 The Goddess Kushmanda is worshipped on fouth day of the navatri festival. 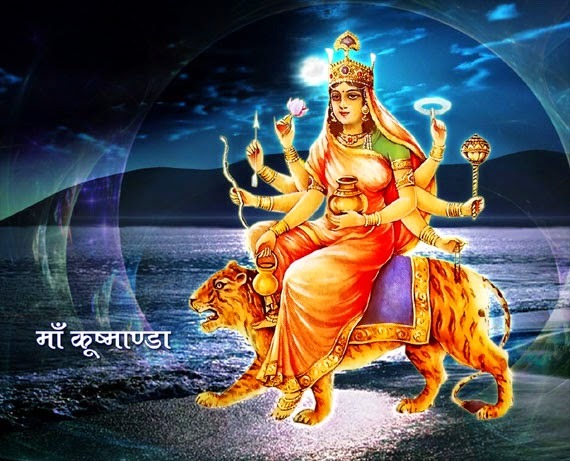 Mata Kushmanda is also known as Astabhuja because of having eight hands. On the right side of hands she holds lotus, bow, arrow and kamandal and on the left side she holds amrit kalash, chakra, gada and jap mala. Her hand holding amrit kalash or nectar jar blesses her devotees with good health and long life. Holding Jap mala blesses her devotees with sources of wisdom. Skandamata is the mother of Lord Kartikeya, the commander in chief among all the devatas. 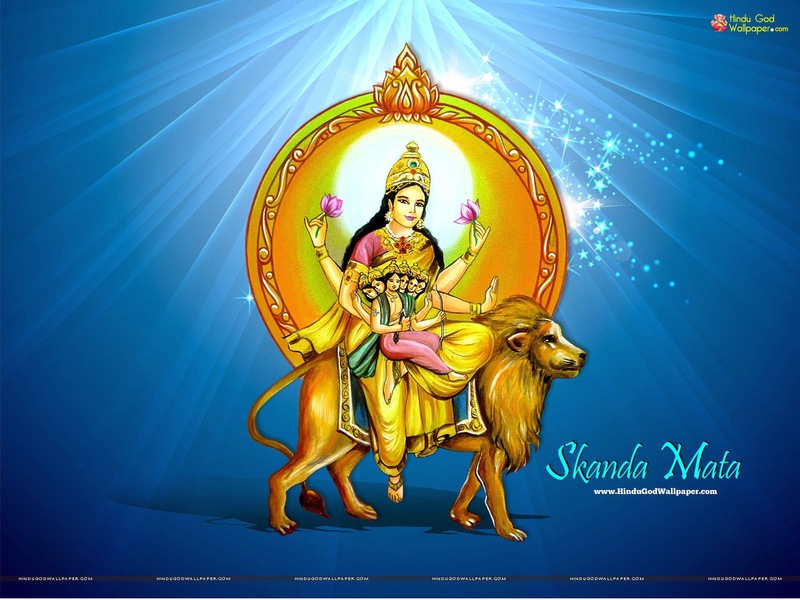 Skanda kumar is the other name for Lord Kartikeya and mata means mother. Goddess Skandamata is worshipped on fifth day of navatri festival. The story behind the divine legend says that there was great demon Tarkasur pleased Lord Brahma doing the extreme meditation. Lord Brahma asked the boon he wanted. Demon Tarkasur asked the boon of being immortal. Lord Brahma tells him that no one in this earth can be immortal. When there is the birth, there should be the death. Tarkasur being clever ask the boon that he can be killed only by the Lord Shiva’s son, believing that Lord Shiva will never get married and will remain Brahmachari in his life time. In this way Lord Brahma grants him the boon for staying immortal. When the tarkasur starts troubling people on the earth. All the god and goddess go to Lord Shiva and request him to get married. Lord shiva agrees to marry to Goddess Parvati. Parvati then gives birth to Lord Kartikeya to demolish the demon tarkasur. The devotees worship the goddess to achieve salvation from any bad deeds. The iconography of Goddess Skandamata mounts on the violent lion and also seen sitting on lotus flower and because of that Skandamata is also known as Padmasana. Goddess Skandamata is depicted with four hands. She carries lotus flowers in her upper two hands. She holds baby kartikeya in one of her right hand and keeps the other right hand in Abhaya Mudra. The sixth incarnation of Goddess Paravati is Katyayani Devi, is worshipped on sixth day of navaratri festival. Maa Katyayani is the warrior form of Goddess Parvati Katyayani Devi was born to the sage named as Katyaavaana. The story tells that Sage katyavaana was the strong devotee and performed hard yagna of Goddess Durga. The wish he wanted that Goddess Durga to be born as his daughter. Goddess accepted his wish. On the other side the powerful demon Mahishasur, who could be killed by Goddess Durga had reached the heaven to conquer the kingdom of the gods. Then goddess durga was formed and sage katyavaana had the privilege to worship Goddess Durga and also named her as Goddess Katyayani. In the month of asvina, Goddess Durga killed the mahishasur and on that day onwards she was remembered by her new name as Mahishasur mardini. The iconography of Goddess katyayani is seen sitting on vicious lion having 3 eyes. On her left side, she is holding lotus and sword. On her right hand she is seen holding varada and abhaya mudra. Kalimata is the seventh form of Goddess Paravati. She is also known as kalaratri. Kalaratri is the most fiercy form of Goddess Paravati.The demon named Raktabeej had asked the boon from Lord Brahma, that his drop of blood when fell on the ground and another clone of his will be born. After getting the boon, the demon started to torture the human beings. All the helpless god and goddess went to Goddess Paravati and kept their problem in front of her. Maa Paravati promised to kill the demon Raktabeej. To kill the Raktabeej, Devi Paravati transformed her into the vicious form of kalaratri. She killed him and drank his blood so that no other clone of Raktabeeej is born. 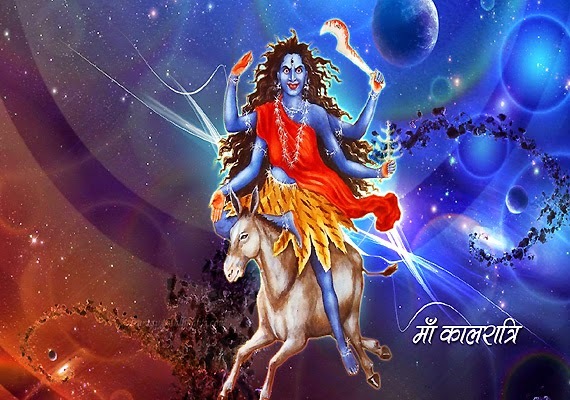 The iconography of Kalratri is seen riding on a donkey with her two left hand holding sword and iron sickle and her other right hands holding abhaya and varada mudra. This manifestation of Goddess Paravati is worshipped on eighth day of Navatri festival is known as Mahagauri Mata. The name Maha means extreme and Gauri is the lady with fair complexion.. She signifies the peace and calmness. On Ashtami (Eighth day of Navatri festival), the devotees fast to seek the blessing of the Devi. Mahagauri fulfills the desires of her devotees and puts an end to their sufferings by washing away all their sins. It is said the when the Goddess Paravati was 16 years old had the dark complexion. When Lord Shiva was impressed by her hardship and devotion at the Himalayas. He accepted her prayers and sprinkled gangajal on her, then her body turned into shinning silver and hence got the name as Mahagauri. The iconography of Goddess Mahagauri is seen riding on bull, wearing white saree with white ornaments. She holds trishul on right lower hand and damru on left upper hand. 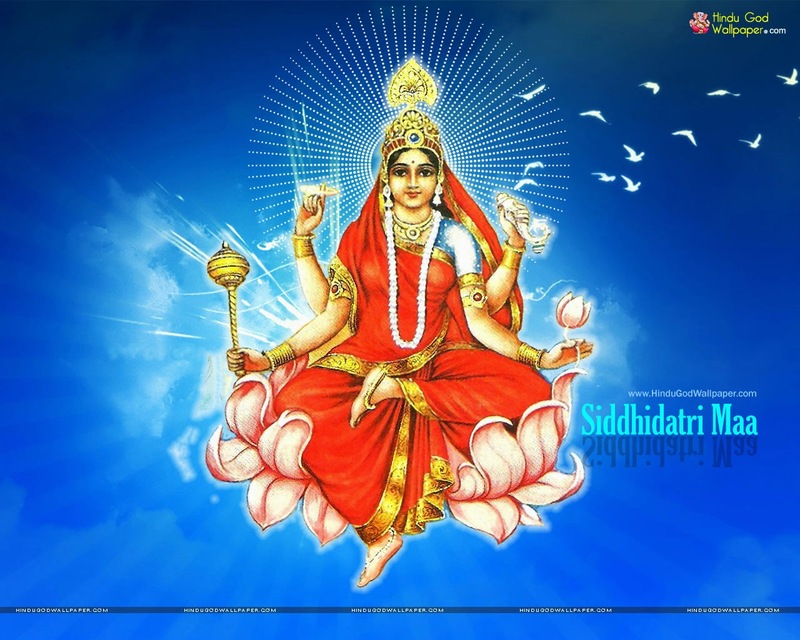 Goddess siddhidatri mata blesses her devotees with power and positive energy. Siddhi means the achievement and datri means one who gives. This Goddess siddhidatri is worshipped on ninth or last day of the navatri festival, which is also known as Maha navami. The iconography of the Goddess Siddhidatri sits on Lotus and rides on the lion. She has four hands. She holds Gada and Chakra in her right hands. lotus flower and Shankh in the left hands. During Maha navami, devotees who fast on this auspicious invite 9 girls and serve the food and offer them with coconut, clothes or money. Doing this they seek the blessing all the forms of Goddess Paravati. Rinse the sabudana twice with the water and soak sabudana them for at least 3 hours or will be best if soaked for overnight with sufficient water just to dip it well. Once the sabudana is soaked and soft. Combine soaked sabudana, roasted peanut powder, mashed potato, crushed cumin seeds, chopped ginger and green chilli, lemon juice, sugar, cilantro and salt into a mixing bowl. Mix everything well until it forms like dough. Pinch lemon sized ball and shape them into vadas. Make all the vadas ready. Into a pan heat the oil and add the sabudana vadas. Fry carefully until they are cooked on the both the sides and till they are golden brown in color. The best way of frying is cook the vadas on medium flame. Serve hot with green chutney or tomato sauce.